Ballycanal Moira is situated in the townland of Ballycanal in a historic location. The 250-year-old Lagan Navigation Canal runs through the site connecting two roads- Station Road and Glenavy/Airport Road and two counties- Co Down and County Armagh. The accommodation overlooks one of the oldest train Stations in Britain, Moira Railway Station. The Heritage Canal Café located at the front of the Manor B&B explores the rich history of the canal, from its formation in 1793 to its closure in the 1954. The exhibition also highlights the story of the Ballycanal sites own history, which had three coal wharves located on the canal banks of the site. A fabulous tree sculptor ‘Life on the Lagan’ depicts the wildlife that surrounds us in the water and along the banks of the canal. The Lagan Navigation Canal travels East to West, 44 km, 27 miles and 27 locks. It passes through three local council areas Belfast, Lisburn and Castlereagh and Armagh City and Craigavon. Prior to the development of road and rail, Britain and Ireland saw a golden age of canal building. The Lagan Navigation Canal was one of the first waterways to be built, with its boats serving local industry carrying coal, grain, sand, timber and linen. The Moira stretch of the Canal transported Coal from Coalisland to local industries and the growing port of Belfast. This serviced the world-famous linen industry transporting raw materials and goods which were loaded onto ships in Belfast harbour trading all over the world. The Ballycanal site was once a busy coal quay which was served by three wharves. Canal boats laden with coal would have been a common sight in the early 1900’s and continued in use until the early 1950’s. The wharves were used to dock boats and offload coal. Pictures of the original farm show the coal sheds which were heavily used by the Canal men. The Lagan Navigation Canal is an important corridor for wildlife, linking land with water. A walk along Moira towpath will allow you to see swans and signets, moorhens, coots, herons and possibly a blue flash of a kingfisher. On a summers day butterflies and dragonflies can be seen and you may hear the croaking of frogs and toads. The Broad Water is a 3 mile (4.8km) towpath walk between Ballycanal and Aghalee. The Broad Water is a man made feature, built in a natural valley in order to retain a sufficient head of water to accommodate the navigation. 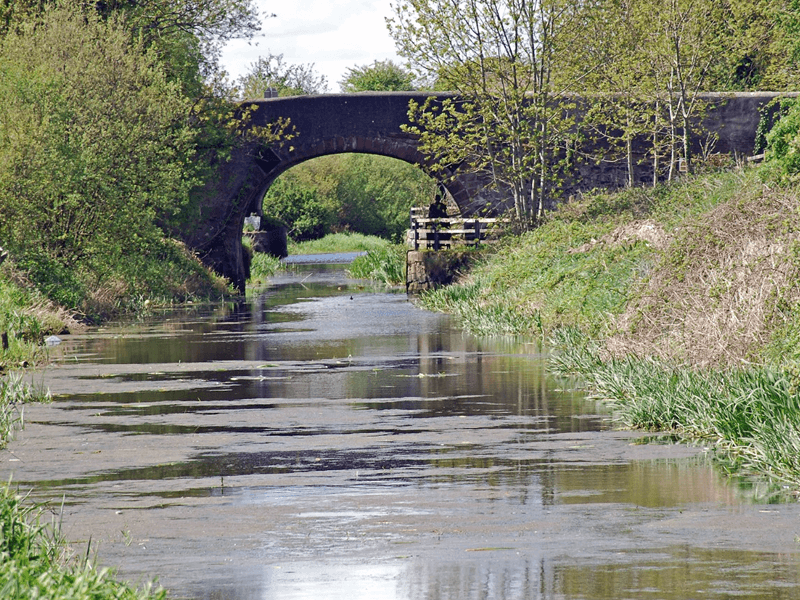 The towpath takes you along the route of the original Lagan Canal through Soldierstown. 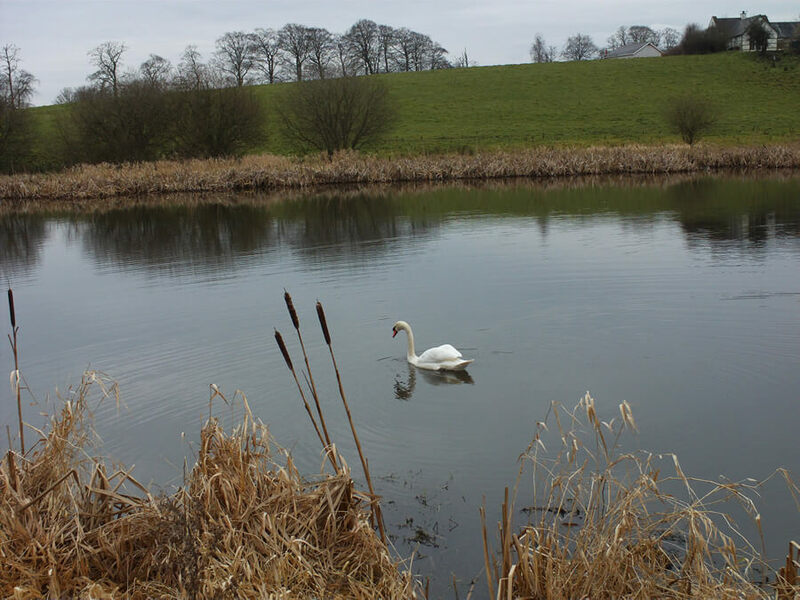 Keep an eye out for the large variety of breeding and wintering wildfowl.Take a seat and enjoy the sights and sounds of nature, set against the background of a thin belt of mature woodland! Lynsay Green a local artist from Moira exhibits ‘Lagan Navigation Links’- an artist impression of the route of the Lagan Navigation Canal from Belfast to Lough Neagh. Lynsay presents the topography of the Lagan Navigation Canal as it was in the 1950’s prior to closure. 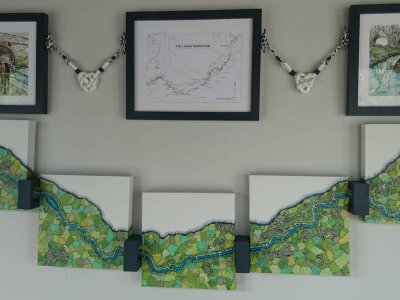 Her intricate sketches of the canal route and towpath are hand-drawn on five canvases connected with handmade wooden bridges. A beautifully illustrated horse and Lighter give the viewer an insight into the workings of the canal. Lynsay artwork cross references to a map of the Lagan Navigation allowing the viewer to establish canal bridges, locks and surrounding settlements along the canal route. Other exhibits delve into the golden age of canal building and its importance in developing industry and providing local employment. The historical site of Ballycanal-Ladybridge Wharf is explored and its previous role as important coal quay.